Metaphors and analogies are more than figurative language suitable only for English classes and standardized test questions. They are “power tools” that can electrify learning in every subject and at all grade levels. Metaphors show students how to make connections between the concrete and the abstract, prior knowledge and unfamiliar concepts, and language and image. To exploit these powers, however, teachers must learn how to use metaphors and analogies strategically and for specific purposes, helping students discover, create, and deconstruct effective comparisons. 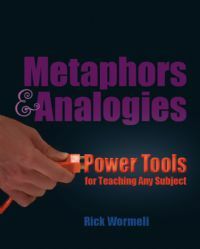 In this thoughtful and nuanced book, Rick Wormeli examines a wide range of powerful metaphors—from the rhetoric of political speeches to mathematical models to concrete spellings and body sculptures that symbolically portray abstractions. Metaphors & Analogies is filled with provocative illustrations of metaphors in action and practical tips about using metaphors to improve assessment, professional development, and symbolic sensing. Imagine the possibilities. One of the first National Board-Certified teachers in America, Rick brings innovation and energy to his writing and instructional practices. He has spent the past 38 years teaching math, science, English, physical education, health, and history, as well as coaching teachers and principals. Rick’s work has been reported in numerous media outlets, including “Good Morning America” and National Geographic magazine. He is a columnist for AMLE Magazine, a contributor to ASCD’s Educational Leadership, and has presented in all fifty states and around the world.